The Keewatin-Patricia District School Board wishes to congratulate Tracey Benoit, Principal of Beaver Brae Secondary School in Kenora, on her recent appointment to the Minister of Education’s Principal Reference Group (MPRG). Benoit will join the MPRG for the 2017-2018 and 2018-2019 school years. The Minister’s Principal Reference Group (established in 2006) is made up of 20 principals and vice-principals from across Ontario who are appointed by the Minister of Education. Principals serving on the MPRG provide the Minister with invaluable advice on a wide range of policy and program matters through their perspectives and experiences with Ministry of Education programs and policies. They also share their individual insights, feedback and recommendations for education in Ontario directly with the Minister of Education. Trustees met at Sioux Mountain Public School in Sioux Lookout on Tuesday, October 10, for a regular board meeting. 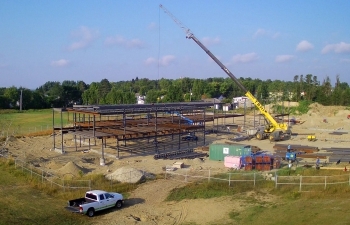 Trustees held their board meeting following an opportunity for a firsthand look at the progress to date on the Keewatin-Patricia District School Board‘s new high school, Sioux North High School. Trustees were pleased with the progress and were informed that the walls have now been erected with roof work to begin within the week. Please click here to view a live stream of the construction. The October Kids Come First presentation titled ‘Project Sunset – Sioux Mountain Public School’ was received by Trustees. Project Sunset Coordinator, Curtis Robb, and Sioux Mountain student, Kanaysah Kakegamic, shared their experiences in the program with Trustees. Project Sunset is an OPP-led initiative, designed to empower children and build skills like resiliency and self-awareness through a strengths-based, outdoors-focused experiential learning curriculum. Some of the hands-on activities students in the program participate in include dogsledding, rock climbing, canoeing, and camping. Kanaysah had plenty to say about the program, including that the program makes her feel safe and throughout the presentation, she referred to those involved as her family. Kanaysah plans to return to the program once she goes on to high school as a mentor for the younger students. Project Sunset is offered to students at KPDSB schools in Sioux Lookout, Dryden and Kenora. Deanna Pacheco, Student Achievement Administrator, presented the Student Achievement report. The position of Student Achievement Administrator was put in place in February 2016 and works closely with central Student Achievement Special Assignment Teachers and school administration. Six KPDSB school were identified as the focus of the student achievement work for the 2017-2018 school year. The work includes school and classroom visits to talk about instruction and assessment, sharing resources and best practices, and support for both school administrators and staff based on school and classroom needs. The province’s renewed Math strategy is also an important component of this work and ultimately, the goal is to see students’ literacy and numeracy scores improve over time. Superintendents Caryl Hron, Joan Kantola and Tania Sterling presented the 2017-2018 Board Continuous Improvement Plan for Student Achievement (BCIP) update. The 2017-2018 BCIP, along with individual School Improvement Plans, guides the work of our schools. Taking a grass roots approach to the plan, this year’s plan development includes increased analysis of school data with school administration, discussions around areas of student and teachers needs in each school, prioritization of centralized supports for schools, consultation with elementary and secondary administrators and central staff to identify priorities, and development of a draft BCIP for sharing with schools for feedback prior to presenting the BCIP to the Board of Trustees.